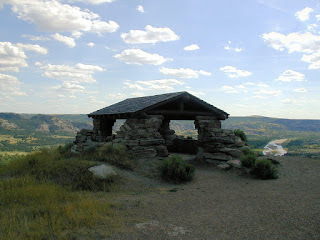 We visited the North Unit of Theodore Roosevelt National Park in North Dakota on July 21, 2006. These photos were taken on that visit. 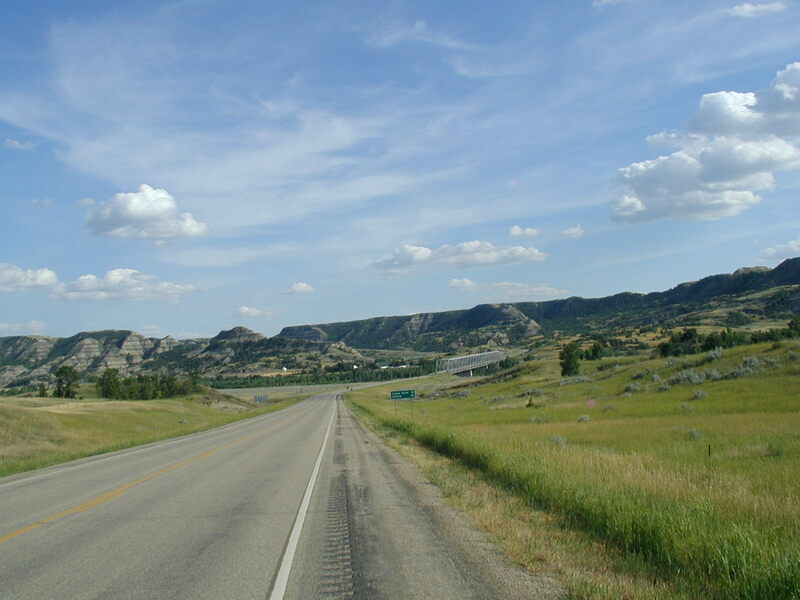 The North Unit of Theodore Roosevelt National Park, North Dakota. Theodore Roosevelt National Park is divided into 3 sections, the most visited is the south Section, the less visited North Section which is 75 miles away, and the even less visited Elkhorn Ranch Unit. The Elkhorn Ranch Unit is the site of one of two ranches Roosevelt owned in the area, and requires a long drive on dirt roads followed by a 1.4 mile hike to reach. We did not visit the Ranch Unit on our trip. 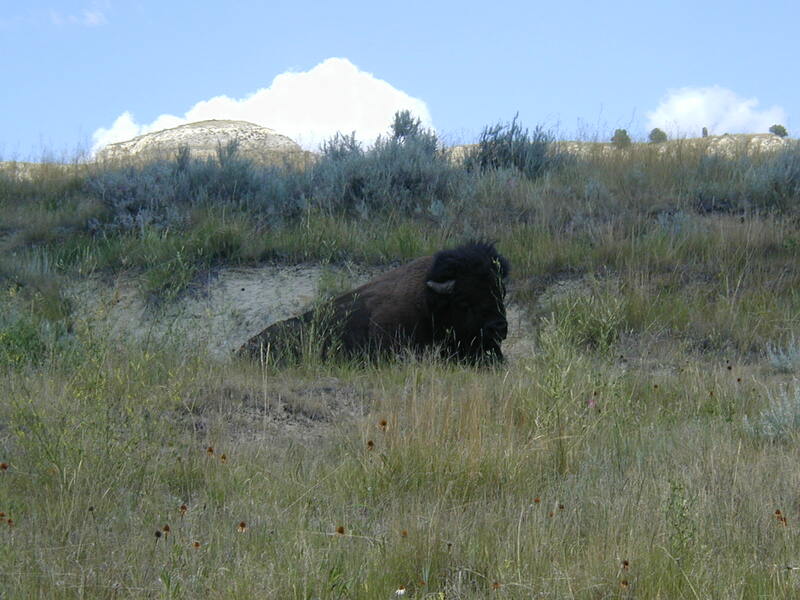 Due to it's distance from the nearest freeway the North Unit gets very few visitors. 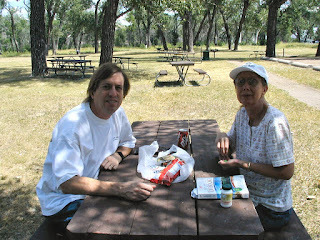 We pretty much were alone for most of the day without any other visitors within sight! 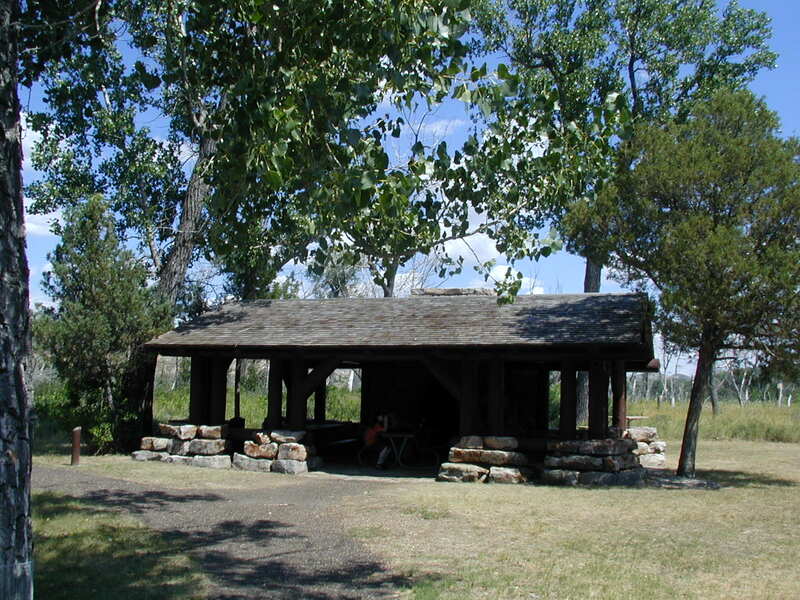 The bridge over the Little Missouri River just outside of the North Unit entrance. 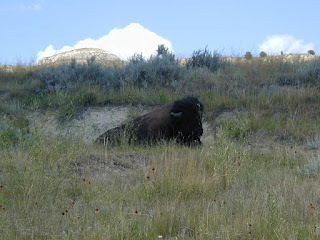 Bison sitting on the side of the road. 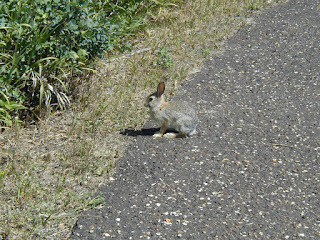 We saw more wildlife along the first mile of road at the North Unit than we saw during an entire day at the South Unit! These round rocks are called Cannonball Concretions. 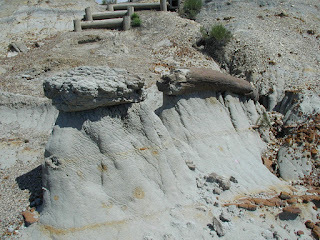 They were formed when minerals in the groundwater cemented sand grains together. A bit like an oyster forms a pearl. 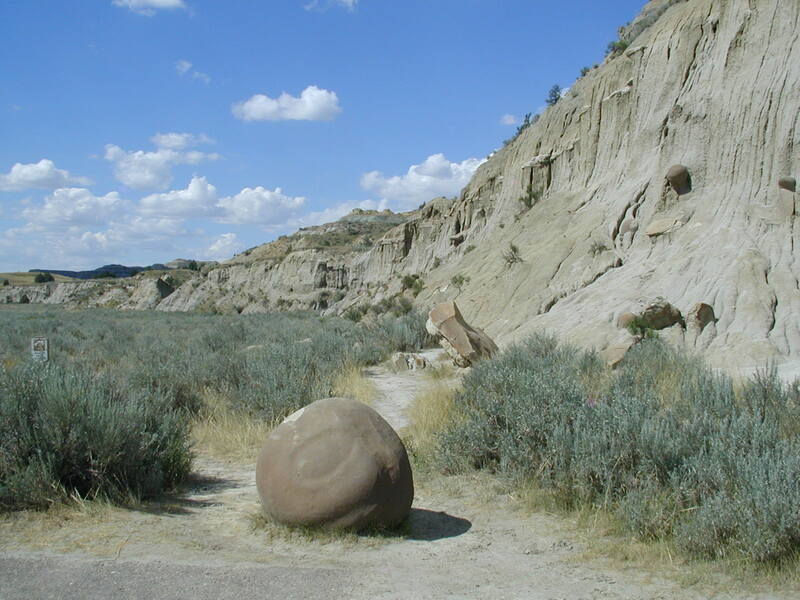 Erosion later exposed the round rocks as the surrounding soft sandstone washed away. 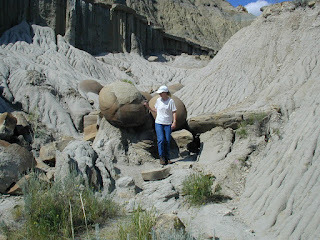 My wife, Julie, looks at a group of "cannonballs". This stone shelter at the River Bend Overlook was built by the CCC in 1937. 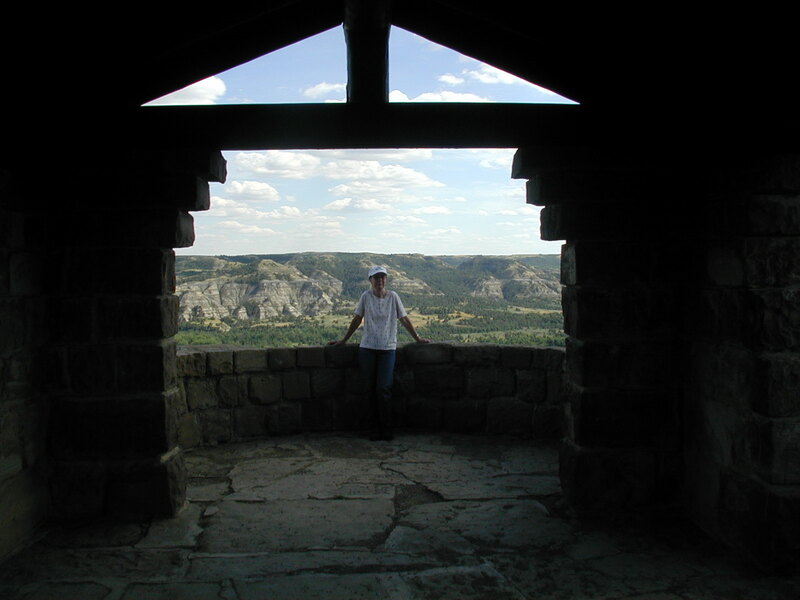 Julie on the viewing deck of the shelter at the River Bend Overlook. Panoramic view taken from the viewing deck of the stone shelter at the River Bend Overlook of the Little Missouri River. 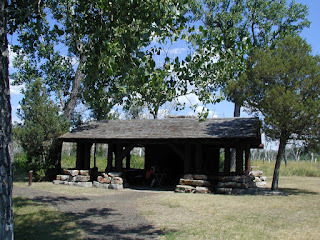 This CCC constructed picnic shelter is at the Juniper Picnic area, where we had a picnic lunch. 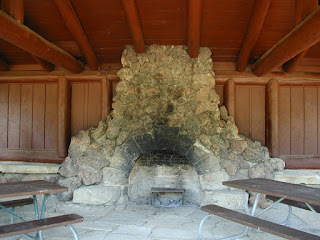 Rock fireplace in the picnic shelter above. Enjoying our lunch! As you can see, we had the place to ourselves. 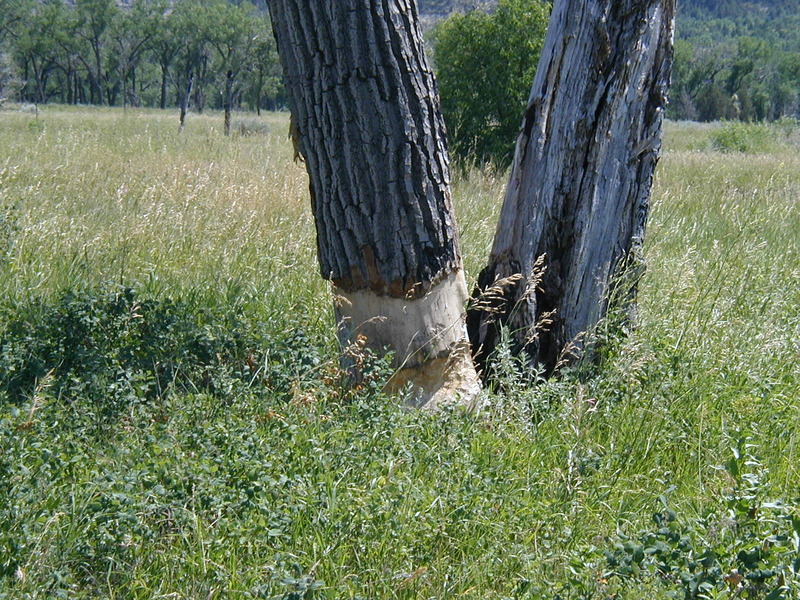 Beavers chewed the bark off this trees. 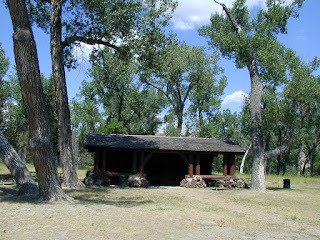 Another CCC constructed shelter at the picnic area. 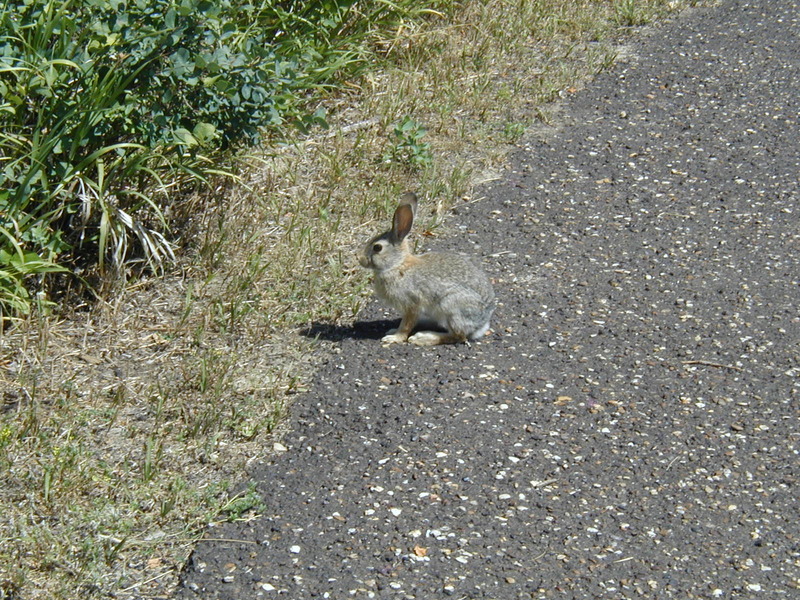 A very friendly bunny on the Little Mo Nature Trail. These rock formations are called Concretion Rain Pillars. Rain has eroded away the softer sandstone leaving a "caprock" on top of a sandstone pedestal. The prairie grasslands. 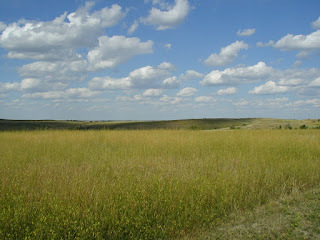 The Little Missouri River cuts through these grasslands. Most of the photos above were taken in the river canyon. 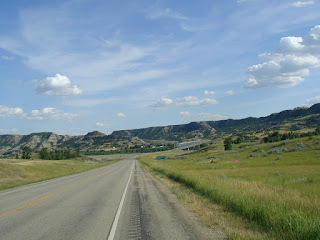 This is what you see for miles in each direction from the top of the canyon if you look away from the river. Panoramic view taken from the Oxbow Overlook of the Little Missouri River. 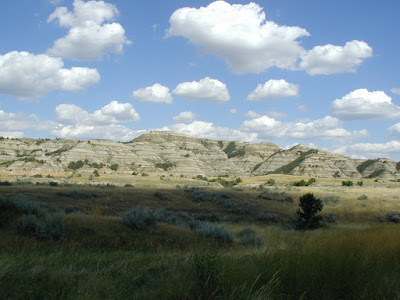 Continue with Stock Photos of the South Unit of Roosevelt National Park.